Mornings are dark, so lighten things up with a quick breakfast smoothie. 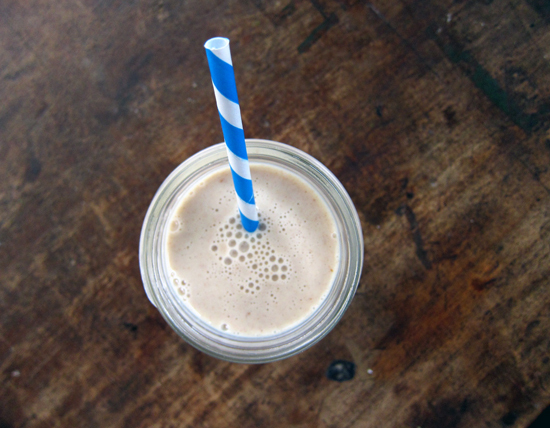 This creamy drink is chockfull of healthy goodness. 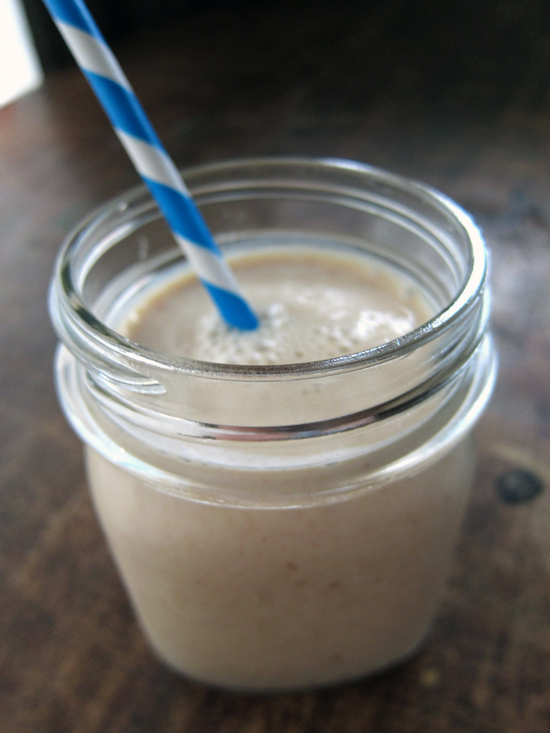 Oats, yogurt, dates, banana and almond milk are blended with a touch of spice for a breakfast shake to start your day. You can use any milk you choose, from cow to soy, but almond is my number one choice here. I used the dates for a natural sweetness, but if you want to sub in maple syrup or honey, go right ahead. I used an immersion blender to keep things simple (I hate a complicated morning clean up), but feel free to use your blender instead. First, oats and almond milk gets zapped in the microwave for a couple minutes. The hot mixture then gets blended with the dates first and then the yogurt, blending well to cool things down before adding the frozen banana slices. 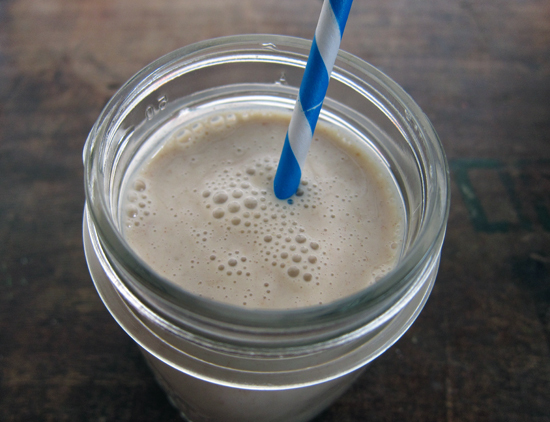 Frozen bananas help to keep this drink extra creamy. I always keep frozen bananas in the fridge for smoothies or banana bread. I'm sure it would easier to peel and chop the bananas before freezing, but I'm lazy, so I always end up with nearly-black scary looking bananas in the corner of my freezer. I'm okay with that and so is this smoothie. The final result is a creamy, filling drink with a hint of spice, nuttiness and sweetness. 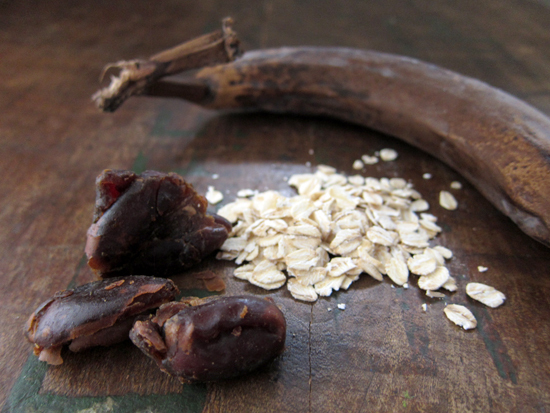 If you've got leftover plain oatmeal, feel free to use that instead of the oats + milk in the first step. If you don't like banana, throw in some ice cubes and; a spoonful of almond butter. Put the oats and almond milk in a bowl and microwave for 2 minutes. Place oat mixture into a blender or tall blending jar (if you're using a stick blender), along with the dates. Blend until well mixed. Add in the yogurt and blend again. Toss in the frozen banana slices, nutmeg and cinnamon and give it a whirl until thick. Add in a little almond milk to make a thinner consistency, if needed. Serve immediately in a tall glass or 2 small ones. perfect! i forgot about smoothies in the winter, but darnit it, why not! with my brown bananas, i have a giant ziploc in the freezer where i just whip off the peel and throw it in the bag and throw it right back in the freezer (literally, 5 seconds fast)... i started doing this after i had a heck of a time peeling the thing once it was frozen! ha. yum! this reminds me a drink i used to get all the time at a restaurant called "breakfast in a bottle." it was like $6.00, so my wallet suffered and i stopped buying them. now i'm totally going to make my own. thanks for the recipe!! Lyndsay, this is the perfect winter smoothie. No fresh fruit needed, just spice and other nice things! And thanks for the banana tip - I'm clearly the laziest person alive. I'm going to make this tomorrow. We don't have a microwave, so I'll probably just use the oats as they are. made this yesterday morning! i only had greek yogurt, so it turned out THICK (I had to scoop it out and eat it with a spoon) but delicious! i also appreciated that all the measurements were 1/4 cup-easier on my foggy morning brain :) thanks!